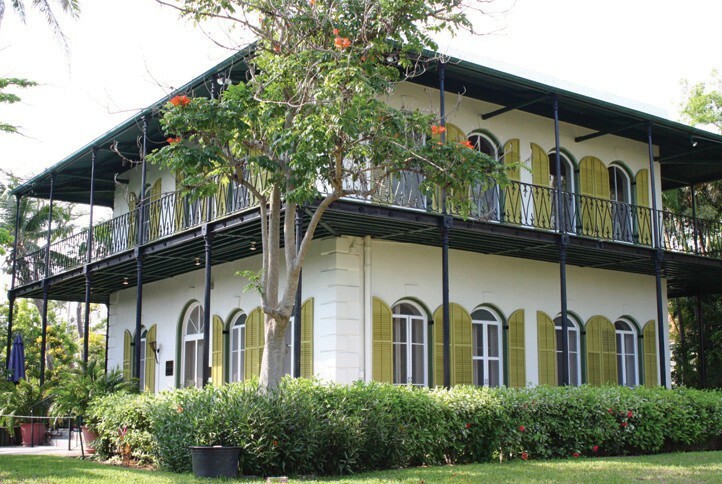 The crown jewel of Key West’s rich literary legacy, Ernest Hemingway’s house at 907 Whitehead St., is a National Historic Landmark. It’s where Mr. Hemingway lived and wrote during most of the 1930s. It’s also famously home to about 50 cats that lounge among the tropical foliage and occasionally leap into visitors’ laps. An average cat has five front toes and four back toes, but those that are descendants of Papa’s cats have an extra toe on one or more paw. All the cats on the property carry the polydactyl gene in their DNA. Tour guides offer a complete narrative room by room, or you’re free to explore the two-story manse on your own. On the upstairs porch, listen to the breeze rustling the palms and imagine the peace and solitude Hemingway might have felt as he hammered out “To Have and Have Not” (with some characters inspired by his Key West friends) and “For Whom the Bell Tolls” on his typewriter. After the press leaked his address, Hemingway and his friend Capt. “Sloppy” Joe Russell (who owned Hemingway’s favorite bar and indulged his taste for big-game fishing) built a brick wall that still stands around the property. The bricks, tour guides note, are a little crooked, suggesting that the hard-drinking writer and his friend might have been a little sauced at the time. The couple purchased the Whitehead Street property in 1931 for $8,000. Including the gardens, it’s the largest property on the island. The pool was added in the late 1930s at an astounding cost of $20,000. The Hemingways and their sons, Patrick and Gregory, lived in the house until 1940. It is filled with original furniture, art, European antiques and trophy mounts from Hemingway’s many safaris. You’ll also find his bookshelf with titles such as “Cranberry Red” by E. Garside, “The Iron Mistress” by Paul Wellman and “Poise: How to Attain It” by D. Starke.